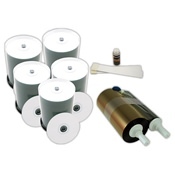 These printable DVD-R media kits include everything you need to restock your disc printer supplies. Media kits may come in a variety of combinations that include some or all of the following: printable DVD discs, ink cartridges or thermal ribbons, cleaning kits, and more. Find the perfect restocking solution at affordable prices for your inkjet or thermal printer right here at CDROM2GO.